← What Happens When I (Finally) Win Rupert? Hey there Clammers! So…Bunny is SUPER excited. Some amazingly cool stuff coming soon from TinyCo and this AWESOMELY fun game. Super Geeky stuff. Being a huge Geeky Nerd girl, I am really giddy with this one. (Still waiting for the Blue Harvest Moon Stuff too.) I have great hopes for this event. So much so, I am got myself a ticket, joined up with some local Geek Podcasters, and am going to be immersing myself in nothing but Geeks. What does that mean? Well, let’s just say Bunny is going to be taking a lil trip REALLY soon. And YOU get to come along for the ride on my journey into all things Geek. MMmmmmm to be immersed in a massive crowd of Geeky Nerd boys. Heaven? 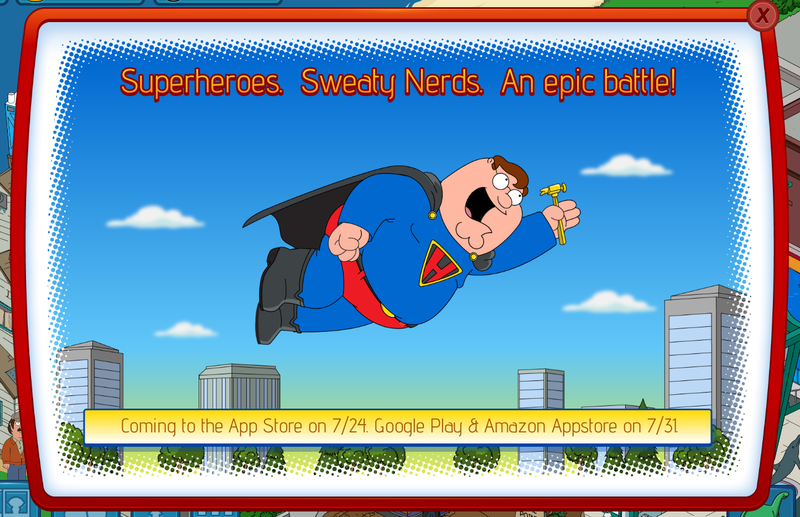 This entry was posted in Characters, Game Play, Special Event, Updates and tagged Family Guy Addicts The Quest For Stuff, Family Guy Superhero Characters, Sand Diego Comic Con, Superman Peter Griffin. Bookmark the permalink. Anyone have any advice besides waiting a week to play again? It isn’t fair to do this to Android users. The delay shouldn’t really matter as long as iOS and Android users have the same amount of time for the event. There’s no real competition in the game with everyone playing individual games and being all different levels so as long as everyone has the same amount of time to finish the event it shouldn’t make too much difference. Will this require carter and stewie? We don’t know yet, but it’s doubtful. Most likely it’ll be like the Full Moon event where it required characters from districts 1-3. Is it abnormal to not having either character yet? I have all but sugar for carter and I’m almost done with the costumes for stewie. Just depends on how it played out for your collection of materials. Each has its own set and it is up to you on what tasks you send characters on to earn items to unlock them. Have you unlocked stewie yet? I don’t think this is an event. It says it will be in Appstores. Not it will be coming to your game. Maybe this is a new app or something. A Family Guy RPG with Superpowers. That’s why it’s delayed for Android. But I don’t like why Android is always in every situation delayed not only with Family Guy but also with other apps. Really excited about this event but as an android user don’t like the idea of being a week behind! Can I log in on my iPod touch to start the event on the 24th and then go back to my android ? Yes, but you must then keep playing on the android. You can’t go back and forth until the android updates. Surely the Android version would send you to Play Store for an update, but of course the update wouldn’t yet exist? Exactly, no update to sync both devices. For a week at least. Love all stuff comic related stuff, just been to comic con here in the UK so realy looking forward to it. 🙂 On a different subject visited one of my friends towns and he had what looked like security towers and fences, new walls and a new car, do we get this when Stewie is unlocked, as the town I visited had everything unlocked. Thanksto anyone who can help. Thats awesome! I actually have a family guy T-shirt with superman peter, aquaman chris, batman brian and robin stewie. I better get a move on to get stewie unlocked in case he is required during the event. I dont want the starwars event to happen until they have perfected their events and everyone has had time to unlock all major characters but I definately share your nerd girl excitement bunny! I want this event so bad! I am a huge comic hero fan! There should be The Flash Quagmire. This event is going to be this best event EVER! I am such a crazy superhero comic nerd! There should be The Flash Quagmire. When does this become available for android users? I’m pretty excited to see what this new event will add to the game. Hopefully it will be a little bit more fair to freemium players than the Full Moon event and this tea party business thats currently going on. However, I’m a little bit concerned because I haven’t unlocked Stewie yet and I have a feeling that he will get a costume with this event. IF that is the case, does anybody have any ideas as to whether we can earn the items to get skins for characters that we haven’t unlocked yet? Haha I figured as much but thought I’d ask anyway. Thanks! After the Rupert event, they should at least let everyone go back to their daily task to get Stewie and other costumes, before they release the next event. But I can understand they want to release this due to comic con. I don’t know what this is but I’m intrigued, excited, curious and nervous for TinyCo. I hope they nail this event, they need to have positive player reaction. However, a week between releases of iOS and android is not a good start. Being an iOS user I in no way feel nannanabooboo about it. I would like everyone to be on a level playing field. I use an iPad for gaming but my phone is android and always will be, so I have particular preferences. Like Bunny I am an enormous geek, nerd, what have you- and all things superhero, fantasy and science fiction have thrilled me since childhood, so this event could be huge. Not as big as a blue harvest event, but big none the less. That android delay bothers me though. What if my game is linked through Facebook and I use both an iPad and my android phone to play what then. Launch it on iOS when it hits. Then, transfer to Android if that is your preferred method. Just make sure you play ONLY on the device that updates first and STAY on that device until the other updates. Otherwise you will run into issues as the other will be stuck on the previous version and won’t show ANY of the new items until it is updated too. Make sense? Yah. It does make the swap back n forth a lil more difficult. It’s only as big as you build it up to be, but that’s the beauty of it. Anyone else going to CC? I’ll buy ya a beer if you talk about FGG with me. No joke. 100% serious 🙂 Are you coming Dan!!!??? I’m run a tiny firm that takes bids on art/concept and dialogue (english majors unite) for independent game makers or OTHER firms who need to hit deadlines or if they hit snags. Mostly it’s digital red pen work and storyboard frame set-up. Will do 🙂 My vendor ‘starter kit’ should be here by the 26th (July). Don’t forget to remind me…are you doing the whole enchilada? Wed-Sun? That’s a lot of geeks and nerds to wade through!!! 26th? Ends 27th, you only goin one day? Nah, I’m just another goon on Thurs/Fri. (Scott Snyder Spotlight!!!!! My goal is to hit every single Batman showcase. My itinerary is so embarrassingly Batman crazy. I’ll be the reporter dressed as a Predator that asks you for beer. I’m gonna be weary of all things Predator now. No more than usual though. Awwww thanks. I thought it was cute. Cybersilly sent it to me. Fyi just wanted to let you know that you can now use golden suit peter on an android if you unlocked him on an ios device. My phone died and played with an iPad. Just recently gold suit peter started to be playable on my android phone. Good to know I’ll have to check it out on my iOS game. One benefit of getting it a week late is that we’ll know almost exactly what we need to do before the event starts thanks to all our Apple-device using addict friends. Also I should be able to finish stewie in that window. me too. Even though i have an iOS device, my primary devices are Android (they’re just better). Pfft!! Don’t know how to do the gesture so……. “Sticking my tongue out at you”!! Appreciate all the work on this site and the humorous way content is delivered. I’m hoping the next event gets back to how things were when the game first launched: longer story lines. Though these skins/characters are cool I really wish there was more development of the dialogue/interaction. It seems like so much less compared to when the game first started. Falcon Peter, Banana Brian, and Ruepert had nothing, Carter was just 2-3 steps, Stewie was even shorter. Stewie, though awesome & funny, seems like a anticlimactic experience based on the wait for him. It all makes the game way less interesting for me. Too much development is put into repeated clicking & waiting and ways to shorten that wait then anything else. Clicking and waiting over and over again without all that great a payoff makes for a bad game imbalance in my opinion. Just not as interesting or fun. Though these skins/characters are cool I really wish there was more development of the dialogue/interaction. It seems like so much less compared to when the game first started. Falcon Peter, Banana Brian, and Ruepert had nothing, Carter was just 2-3 steps, Stewie was even shorter. Stewie, though awesome & funny, seems like a anticlimactic experience based on the wits for him. It makes the game way less interesting for me. Too much development is put into repeated clicking & waiting and ways to shorten that wait then anything else. Clicking and waiting over and over again without all that great a payoff makes for a bad game imbalance in my opinion. Just not as interesting or fun. Another commenter said it perfectly a while ago when he/she said, “In this game, the quests don’t come after unlocking characters. The quest line comes before, not after.” Just such a lack of dialog and everything feels so rushed. A light bulb went off in my head just now. The game IS called “the quest for stuff.” So all this clicking and waiting is really the most basic premise of the game! But I agree. Too many things to just click and wait, and no real story for unlocking characters. I sign in a few times a day, click, and sign off. Nothing else to it. I wish quest dialog ended on a part 12 and not a part 3. So Bunny, you a Big Bang Theory fan? That show would seem right up your alley. If so, who’s your favorite character? I giggle at that show, but I am more a thinker Geek in some ways. It reminds me probably TOO much of many of my friends. Lol. Fav? Hmmm….still debating on that one. 1) do you have to finish the Freaks and Geeks questline before the event? I finished the second task where Lois wets herself, but it has totally disappeared after that and the nerds still wander free through my Quahog. 2) can you login to your game using the same FB account on both your iOS and Android device? What happens to the missing material (i.e. Gold Peter suit when you login on Android)? 1) Freaks and Geeks is part of District 8, so I’m fairly certain it’ll be independent of the Superhero update. 2) Yes. The Gold Suit Peter just doesn’t appear on your Android game. IM CALLING IT RIGHT NOW! all i can say is hopefully this will not be something that relies heavily on using stewie because i (& i’m assuming most other players) haven’t unlocked him yet. i’m getting there but still need a little more time. so i will be majorly pissed if this relies much at all on using him. They are happy to charge me the same as an apple customer, I should get the same service. Has anybody successfully obtained a refund from google play for TQFS in the past, I’m going to try. Tinyco is alienating half the users for no reason, its not like people are going to buy a new device for this one game. It is not in TinyCo’s hands. Not what so ever. Keep in mind they are dealing with outside companies and still have to get their approval on each and every single update that push through that market. They work tirelessly around the clock to get these pushed as fast as they can and as close to one another as they can. Once submitted to the app markets…it is out of their hands. If TinyCo had a choice, they would all drop at the exact same time to all markets. A lot of times the app stores require a contract stipulation with a company for their apps. This is what happened with Golden Suit Peter (which is why he’s only on iOS)…this very much could be the case here. Still don’t buy it, if tinyco wanted to release at the same time then they could just delay the apple release until the 31st. They obviously have a deal with apple for exclusives and early release of content. Android users really shouldnt have to wait a whole week thats some crap. Iphone already gets a golden suit peter which we are not able to obtain. If you want to release stuff into a game it should be released at the same time on all platforms. This seems like they are intentionally delaying this for Android for whatever reason. Wasn’t the previous events only delayed for the App store because they were waiting for approval from Apple? Correct on Android usually launches prior to Apple. It is not intentional on the delays. Trust me when I say they would LOVE to have them drop all at once. I don’t know all the ins n outs on the app side of things, just that they submit all at same time…then wait for approval. What is this? No info given. An event with different start dates? It’s a sneaky sneaky tease from TinyCo about things to come…. Much like any other event out there…we NEVER release info until it is live in the game. Too much can happen between now and then. Characters held back, times or tasks changed, etc. Just too many variables. When we release info, we prefer it to be done with accurate and correct information for our readers. There are a lot of “hoops” you have to go through to launch items via apps. Some allow them through faster than others. TinyCo is still working with all the markets to sync the apps closer together, but ultimately it is up to that market on approval of the release. Not a fan of these 1 week delays for app stores. But it might be some contractual obligation they have with apple, like golden suit Peter. Wait. So what is this? Is this a quest for stuff event? Why do apple users get it a week early? Will they get an advantage in stuff-getting? We have no idea how it will all play out. Not a fan of these time gaps though!